As corporations begin reporting second quarter earnings this week, they will paint a picture of robust recovery that starkly contrasts with the stalled job market. Indeed, corporate profits had already made up all of the ground lost in the recession, and then some, by the first quarter of this year. The country’s labor market, however, still has far fewer jobs than it did at the start of the recession in December 2007. The Chart shows trends in both corporate profits (both privately and publicly-owned) and employment since the start of the recession. 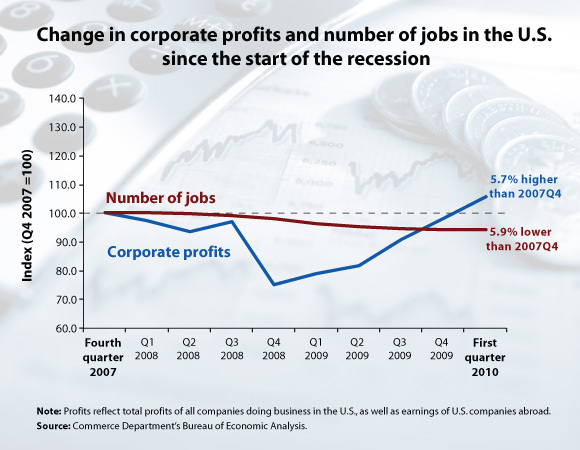 The chart indexes both to 100 at the start of the recession so the lines indicate how far profits and employment have recovered. Although corporate profits suffered in the early part of the recession, they have been steadily growing for more than a year and are now 5.7% greater than they were at the start of the recession. Total profits of U.S. corporations, as compiled by the Commerce Department’s Bureau of Economic Analysis, were at $1.50 trillion in the fourth quarter of 2007 and reached $1.59 trillion in the first quarter of 2010. Over that same period, the country lost 8.2 million jobs, or 5.9% of the job base. In other words, about one out of 20 jobs has simply disappeared. While job growth has resumed in recent months, the pace of job creation remains glacial, and as the chart shows, not nearly sufficient to recoup the losses suffered any time soon. Corporations have been able to restore their profitability in the midst of the worst economy in generations even though sales levels are still below those before the recession began. When employers are able to recover their profits many years before their employees can even hope to attain the income and employment levels they had prior to recession’s devastation, economic policy is clearly skewed in favor of corporations and not workers.